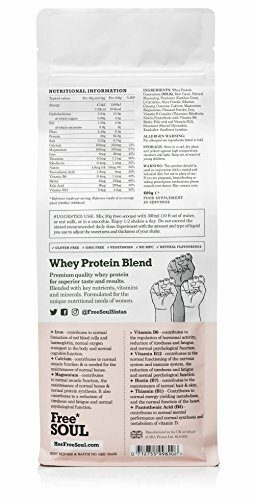 Free Soul Whey Protein Powder Blend – Formulated for Women | The 80% Whey Protein Powder Blended with Natural Ingredients Supports Female Nutrition, Hormone Balance, Mood and Energy | Gluten and Soy Free Protein Shake (600g) (Chocolate). A complete lean whey protein blend formulated for women. Made with premium quality 80% whey protein for superior taste and results and blended with key nutrients, vitamins and minerals to support hormone balance, mood and energy. Carefully sourced, premium ingredients have been blended into Free Soul protein including; Peruvian maca to support hormonal balance; guarana to aid metabolic function; Siberian ginseng as a powerful adaptogen; iron, calcium and magnesium for energy and bone health; flaxseed for essential omega-3s; L-Carnitine for energy production; and vitamins B1, B3, B6 and B12 for healthy hair, skin, and nails. ✔️ GUILT FREE, GREAT TASTE, : You should enjoy being healthy, protein powders don’t have to taste like chalk. Mix 2 scoops (30g) of Whey Protein Powder into 300ml (or to your liking) of water or nut milk for a great tasting, creamy guilt free shake. You can also add your Free Soul protein to pancakes, smoothies or any number of gorgeous, healthy recipes to make sure you get your protein in and fight the dreaded sweet tooth, which has you reaching for chocolate or sweets. ✔️ SPECIFICALLY FORMULATED FOR WOMEN: Free Soul protein is scientifically formulated to promote lean muscle growth, support muscular recovery and fuel your muscles for high intensity training. Supplementing with Free Soul protein pre or post workout on a daily basis supplies your body with macronutrients that promote lean body composition, curbed appetite, optimum performance and well-being. ✔️ ULTIMATE LEAN PROTEIN: The best quality whey protein powder containing 20 grams of protein per scoop, only 112 calories, plus some other goodies. Peruvian Maca, to regulate female hormone balance and improve mood. Siberian Ginseng and Guarana, a natural stimulant to subtly boost energy levels. L-Carnitine, aiding metabolism and energy levels. Also; Iron, Calcium, Magnesium, Vitamin B Complex and Flaxseed. ✔️ NO NASTY BITS: Gone are the days of that gross bloated feeling you get with a lot of protein shakes. Backed by real science, to enhance the health and wellbeing of women, Free Soul is an honest, straight talking brand that supports, empowers and celebrates women. Our products have been developed and manufactured in the UK by leading nutritionists and independently tested to ensure you get only the highest quality, premium nutrients you need and no nasties you don’t. ✔️ THE FREE SOUL FACTOR: We’re more than just a supplement company, we’re a movement. It’s our mission to provide women of all fitness levels with the highest quality, tastiest, health supplements out there! The Free Soul team seeks to not only boost your health and well being, but to empower you to be the best version of yourself. Are you going to join the Free Soul Sistahood?